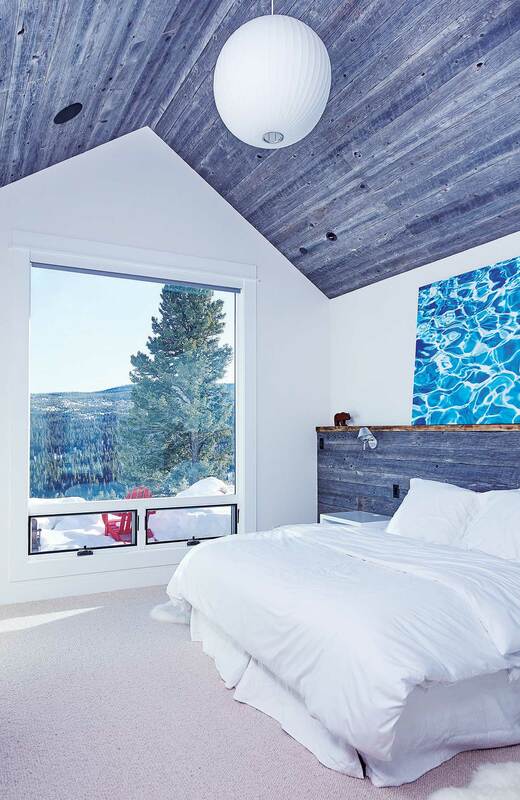 ASK BILL COLLINS TO NAME HIS FAVORITE FEATURE of his family’s newly built Big Sky, Montana, home — aside from the garage, which is more like an immaculate, state-of-the-art man cave — and he’ll admit that it’s the outdoor shower. It’s here, standing under the warm water while looking out toward the thick timber and mountain views — where the only creature that’s likely to catch a peek is a wandering deer, moose, or elk — that he can truly relax and appreciate this newfound life. 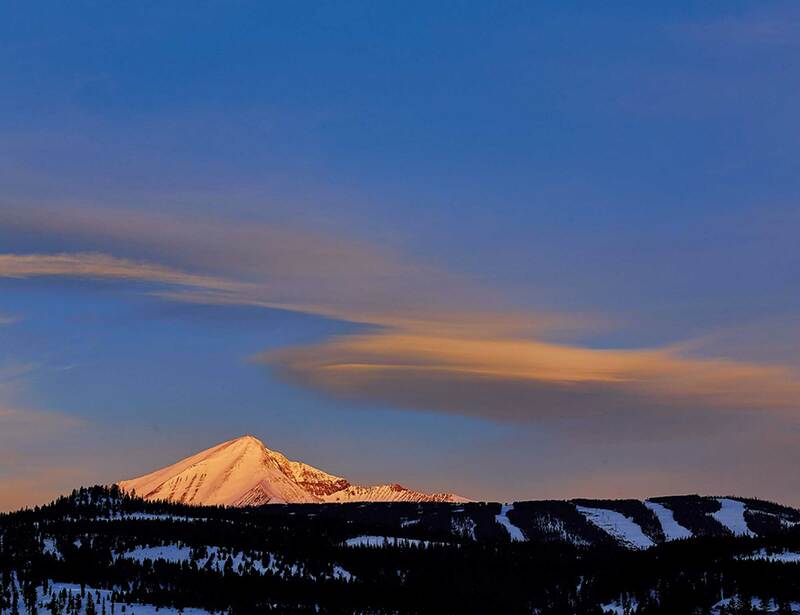 When Bill and Shannon Collins moved from Boston, Massachusetts, to Big Sky, they were ready to let go of the commutes, the fast pace, and the 4-hour drives to ski. 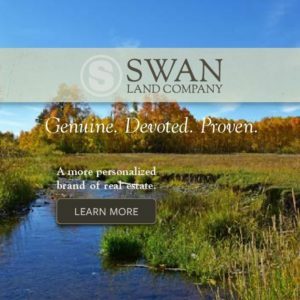 And they wanted their daughter, now 8, to experience small-town living and a healthy dose of nature. 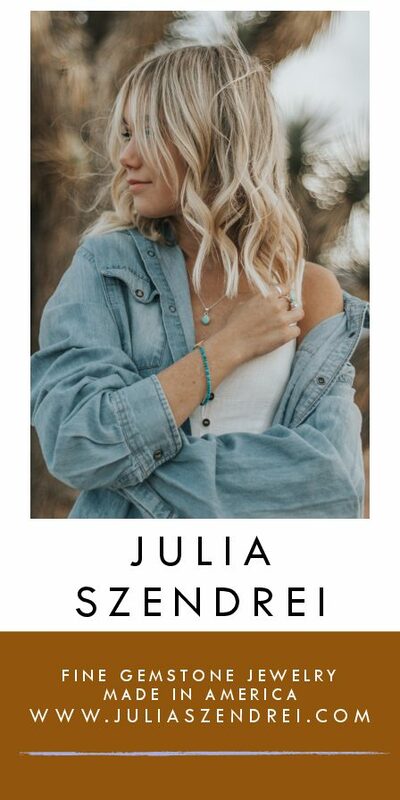 Bill was no stranger to mountain towns; he spent a few years ski bumming in Vail, Colorado, before he took up a career in the commercial real estate industry, and the family made frequent trips to Jackson Hole, Wyoming, to visit friends, fish, and ski. 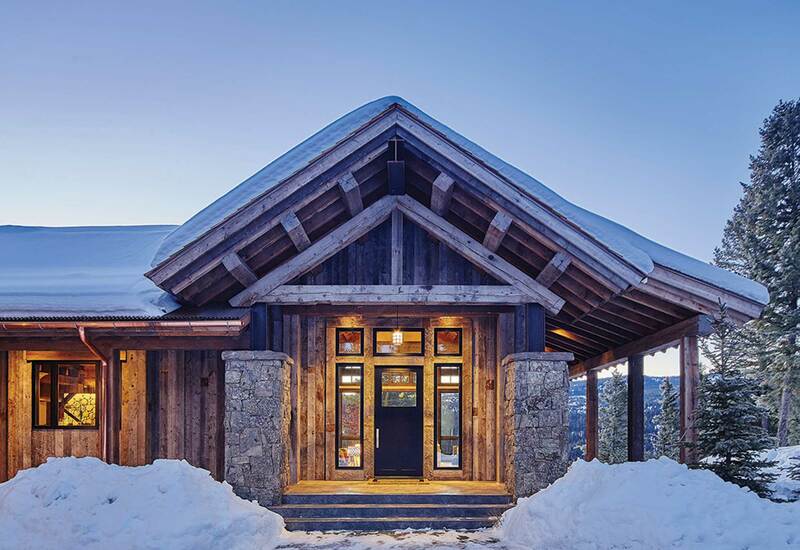 When Bill took a job in 2010 as director of sales for the Yellowstone Club, a private residential ski and golf club, their mountain living dreams came true. 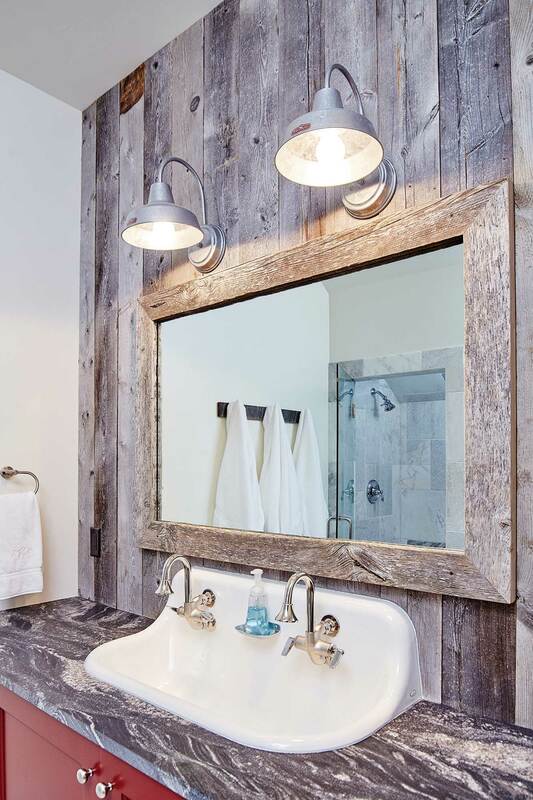 But it wasn’t until their home in the Spanish Peaks community was completed in 2014 that it fully came to fruition. The home feels remote on its 6-acre lot, yet it’s close to the town center; it’s relatively small, given the area, with 4,000 square feet of living space (5,300 including the garage), yet it feels surprisingly spacious; it’s traditional, yet it has contemporary touches throughout; and it’s comfortable, yet elegant. Walking through the front door from the courtyard, the home is bright and airy with large windows facing the tree-lined hillside, high ceilings, and an open floor plan that joins the kitchen, dining, and living rooms. “We wanted to build simply and use the space in the way that we like to live,” Shannon said. Shortly after purchasing the lot, the Collins were approached by Jamie Daugaard, principal of Centre Sky Architecture. As it turned out, Daugaard had already spent countless hours on that very lot designing a home that wasn’t built due to the recession. He was oozing with ideas and couldn’t wait to bring them to life. 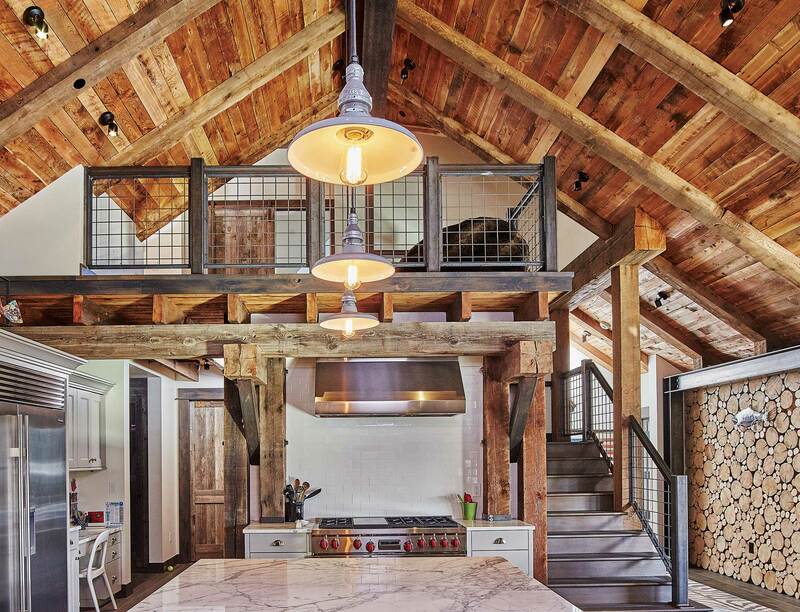 Daugaard created a traditional, barn-like exterior and used a mix of timber, reclaimed lumber, stone, and steel inside and out, leaving some details exposed for the sake of simplicity and natural beauty. “We liked that hybrid application of timber and steel for the exterior, and it’s already weathered together; it looks like it’s been there for a long time,” he said. Shannon and Bill took the lead on the interior design, staying with pale grays and whites, allowing the accents to add lively pops of color throughout. 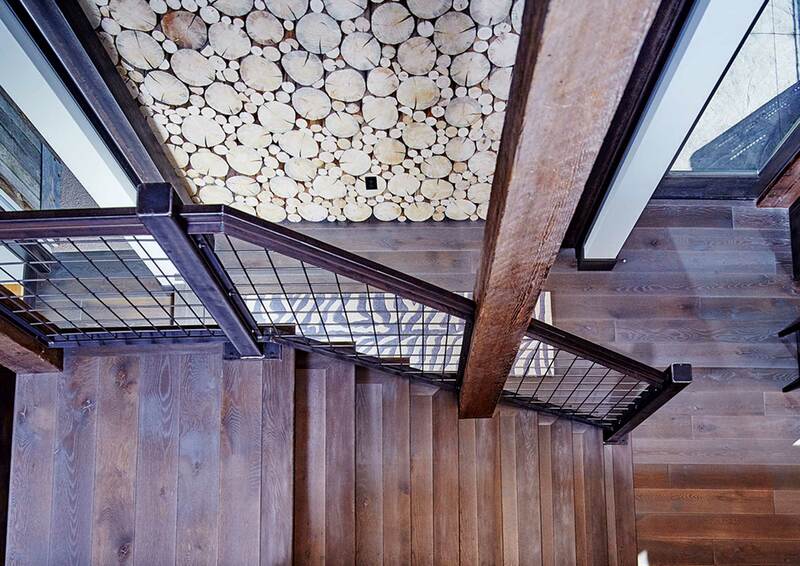 The staircase is lined with a steel wall, steel handrails are made from repurposed railroad tracks, sliding barn doors are used throughout, and a wall off the kitchen is made of stacked wood encased in steel for a one-of-a-kind twist. The kitchen is spacious and bright, with traditional cabinets and marble counters mixed with industrial steel light fixtures. Bill’s work life can be chaotic at times, but now instead of hosting meetings in a boardroom, much of the time his venue is a ski slope or a blue-ribbon trout stream, and the work talk is fit in on chairlift rides or while releasing a trout from a fly line. 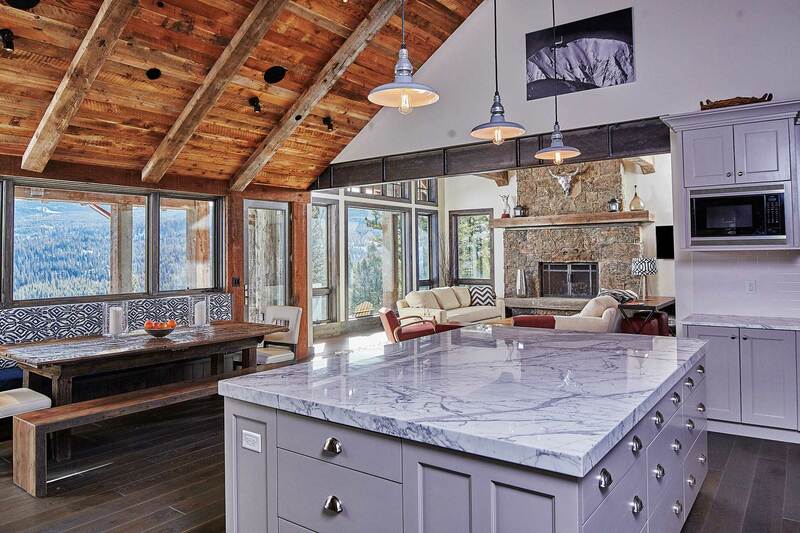 A blend of materials in the interior add industrial touches to a more traditional rustic design, where marble countertops and classic cabinets meet modern light fixtures and exposed steel accents. 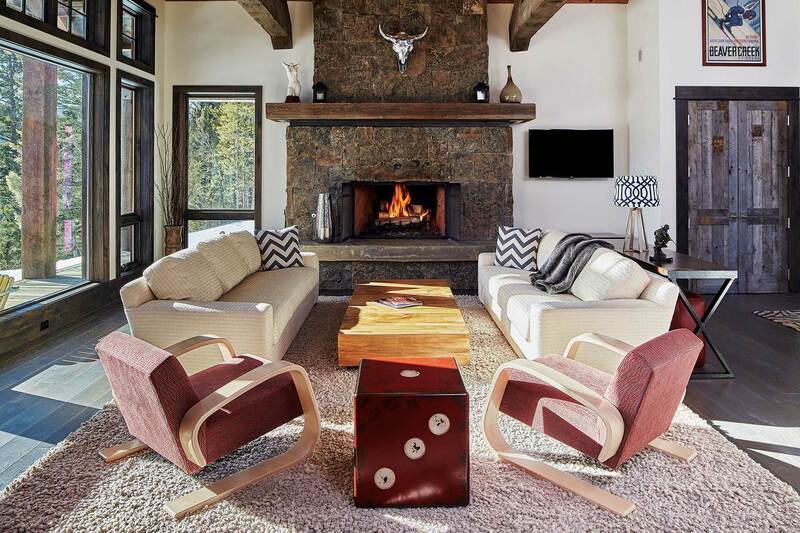 The living room feels light and airy, featuring a wall of windows that look out to the timbered hillside and mountain views. 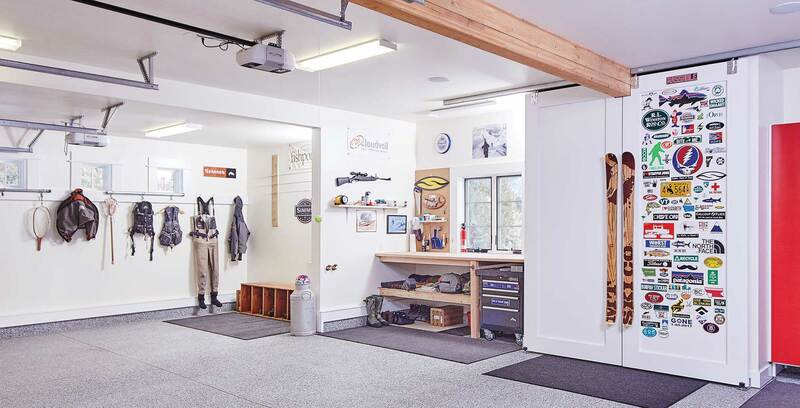 The highly functional garage serves as an organized gear room and workspace. 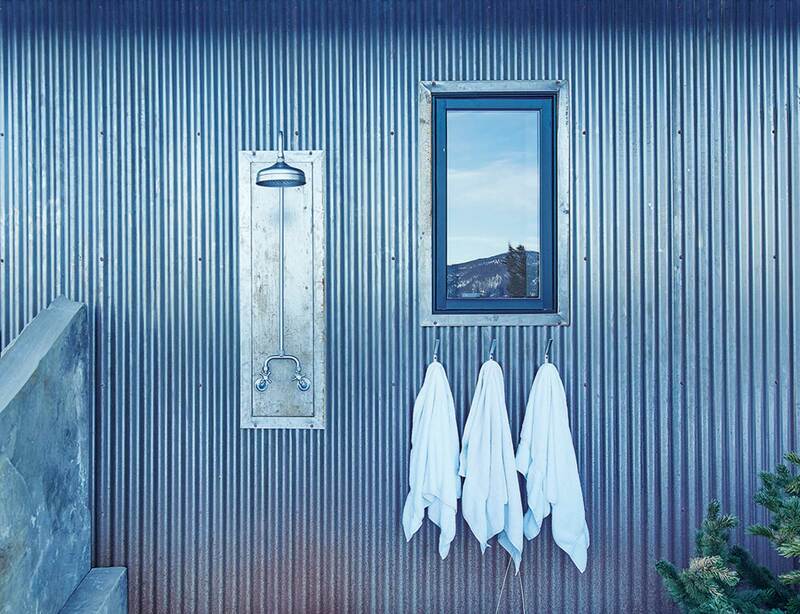 An outdoor shower is a nice amenity for summer days. The open floor plan joins the kitchen, dining area, and living room, offering different places to congregate when guests visit. 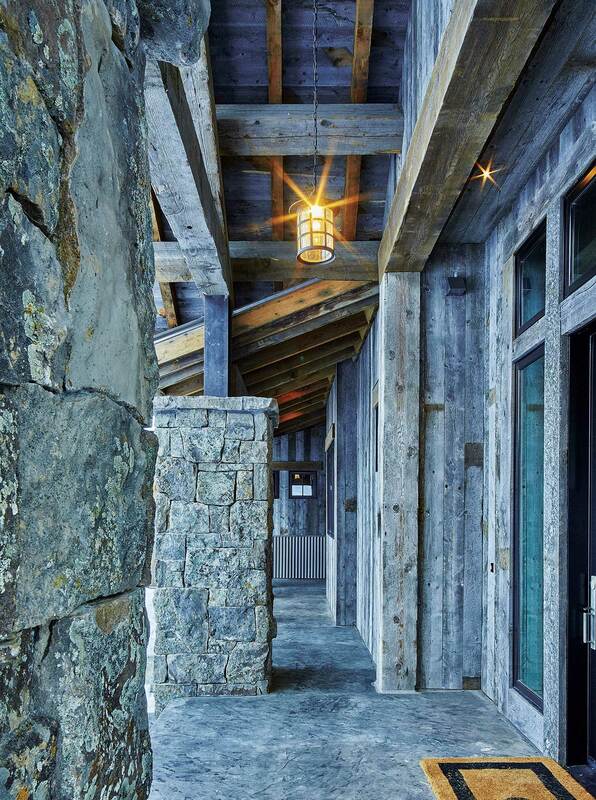 The exterior is a blend of stone, reclaimed lumber, and steel, fitting organically into the natural surroundings. 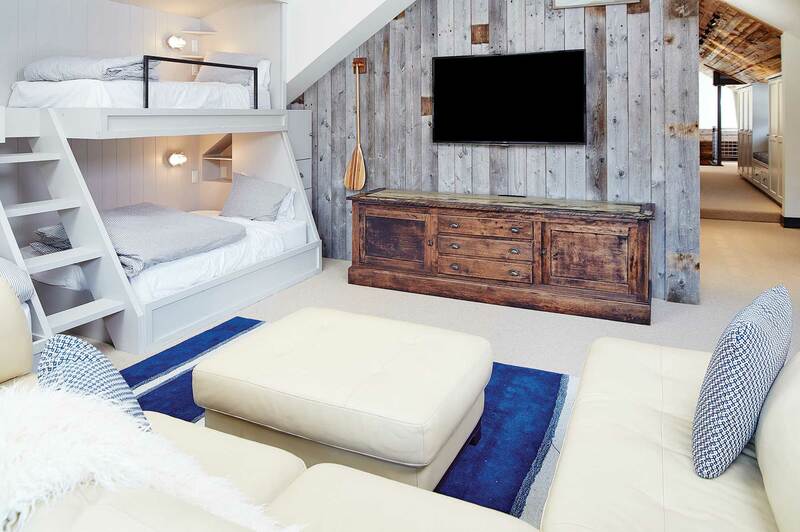 Guest quarters are tucked away upstairs, where a bunk room doubles as a family room. The hot tub sits out back, perched on a hill overlooking the Ousel Falls trailhead. 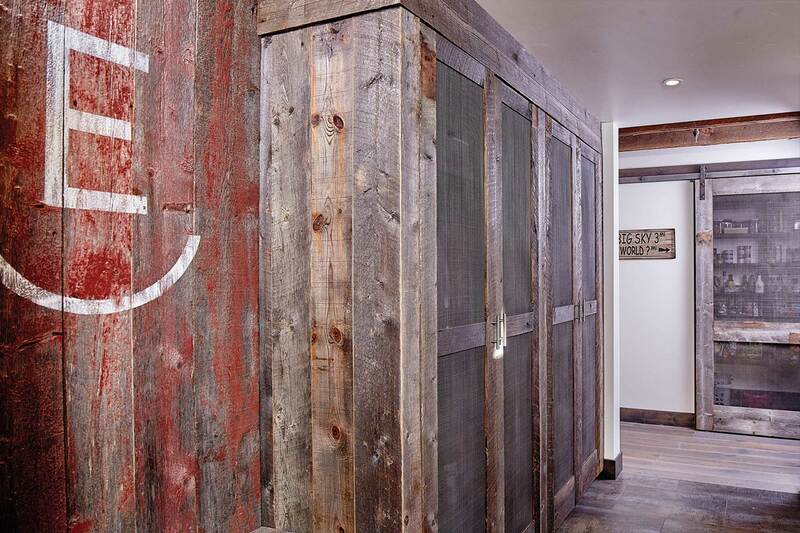 The bathrooms hold onto the rustic charm, complemented by modern industrial fixtures.